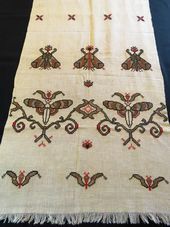 Here is a gorgeous antique metallic hand embroidered linen towel or runner featuring figural images of a butterfly and bee. 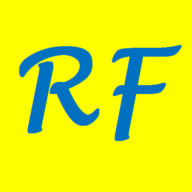 The hand embroidered work is in metallic gold bronze and silver metal theads and red and black cotton threadwork. I believe that this might be an antique Ottoman period Turkish linen towel or a Engish Victorian Arts and Craft table runner. 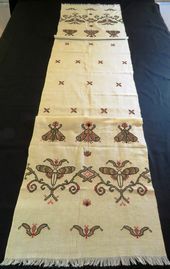 There are figural images of a butterfly and bee with other hand embroidered areas throughout the antique metallic towel table runner. Antique Metallic Embroidery Towel Measurements: 73 1/2" x 18"
There is a small fringe at each end of the antique metallic embroidery linen towel table runner. The fabric is a warm ecru linen. 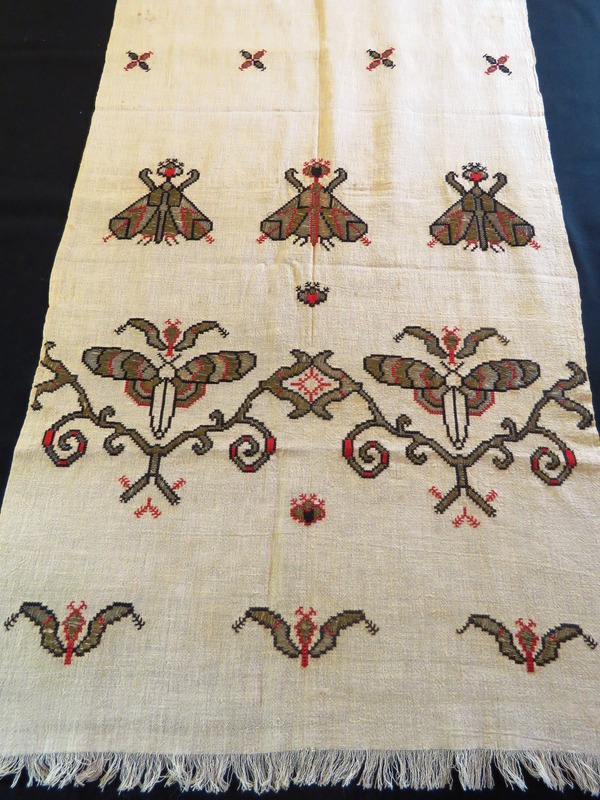 The antique metallic embroidery linen towel table runner is in excellent condition. Some small faint golden age storage spotting and discoloration on the antique linen towel table runner (please see photos). It is in "as found" condition.